Janet Malcolm first became interested in the controversy when she read the 1989 biography of Plath titled Bitter Fame, which she read not out of an interest in Plath but because she was interested in the biographer, a former schoolmate named Anne Stevenson. This biography was attacked for being “propaganda” that served the wishes of the Hughes family, especially Olwyn Hughes, Ted’s sister, who was then in charge of Plath’s literary estate. This obviously biased biography could not be telling the whole truth. But is there a single, whole truth to tell? 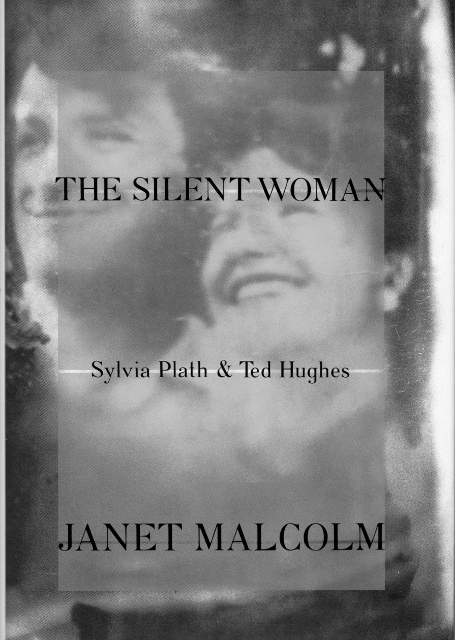 That’s the question that undergirds The Silent Woman, Malcolm’s book about the Plath legacy. But a person who dies at thirty in the middle of a messy separation remains forever fixed in the mess. To the readers of her poetry and her biography, Sylvia Plath will always be young and in a rage over Hughes’s unfaithfulness. She will never reach the age when the tumults of young adulthood can be looked back upon with rueful sympathy and without anger and vengefulness. Ted Hughes has reached this age—he reached it some time ago—but he has been cheated of the peace that age brings by the posthumous fame of Plath and by the public’s fascination with the story of her life. Since he was part of that life—the most interesting figure in it during its final six years—he, too, remains fixed in the chaos and confusion of its final period. Like Prometheus, whose ravaged liver was daily reconstituted so it could be daily reravaged, Hughes has had to watch his young self being picked over by biographers, scholars, critics, article writers, and newspaper journalists. In a work of nonfiction we almost never know the truth of what happened. The ideal of unmediated reporting is regularly achieved only in fiction, where the writer faithfully reports on what is going on in his imagination. When James reports in The Golden Bowl that the Prince and Charlotte are sleeping together, we have no reason to doubt him or to wonder whether Maggie is “overreacting” to what she sees. James’s is a true report. The facts of imaginative literature are as hard as the stone that Dr. Johnson kicked. We must always take the novelist’s and the playwright’s and the poet’s word, just as we are almost always free to doubt the biographer’s or the autobiographer’s or the historian’s or the journalist’s. In imaginative literature we are constrained from considering alternative scenarios—there are none. This is the way it is. Only in nonfiction does the question of what happened and how people thought and felt remain open. Leaving aside the question of how Malcolm’s statements might apply to works of imaginative fiction with unreliable narrators—or in which the author intentionally leaves facts open to interpretation, it’s fascinating to consider that in some respects fiction could be more true than nonfiction. Once I thought about it, it makes sense. Fiction is part of a closed world, all in the author’s mind, and even if the author deliberately leaves options open, that openness is part of the author’s created world. With nonfiction, there really is a truth that happened, but there are so many mediators between that truth and the reading audience, each interpreting the facts differently or choosing which facts to reveal, with some having a stake in how the story is presented and understood. How can one be sure of the truth? Malcolm compares the truth of a life to a disorderly house belonging to someone who never throws things away. It is “unmediated actuality, in all its multiplicity, randomness, inconsistency, redundancy, authenticity.” The job of a biographer is to bring in garbage bags and clear out what isn’t needed so the important things will be visible. But there’s a risk in throwing out too much, or throwing out and leaving in the wrong things. That’s the challenge any biographer faces; it’s no surprise, then, that the end result is often surrounded in controversy. As someone only moderately interested in Plath and Hughes, but very interested in reading and writing, I found this immensely rewarding. Malcolm raises so many good questions about the reading and writing of biographies. She doesn’t answer them, but I suppose the fact that she continues to write is a sort of answer. She must see some value in it. The pursuit of truth through nonfiction may be futile (and I’m not convinced it always is), but seeing the complexity of a story has rewards, even if we’re never able to do much more than speculate about what really happened. I deal with Malcolm in the last chapter of American Isis: The Life and Art of Sylvia Plath. I’m more interested in the biographic process than the lives here too (though I find Plath fascinating, both as a bit of a relic of teenage years and because she lived in the same house I lived in in graduate school in the UK), so this does sound appealing. Most of my interest in Plath is leftover from my teenage years, too, but reading this got me interested in revisiting her poetry and possibly The Bell Jar. I loved that passage about Plath — and by extension, Hughes — being stuck in a phase of her life where she was young and angry. Neither she nor Hughes get a chance to be all the other things they would have been (in the eyes of the literary world), which is a shame. I’m glad you liked this! I really loved it — Janet Malcolm has frustrated me recently, but I think her writing and her ideas in The Silent Woman were great. I thought that insight was really good. So often, horrible times look so different in hindsight, once you get some perspective, and that just couldn’t happen for them. I’m definitely going to read more of her books. I’m thinking of The Journalist and the Murderer next because I remember the story that it’s about. My last chapter is about the biographic process, as are my books, A Higher Form of Cannibalism? Adventures in the Art and Politics of Biography, and Biography: A User’s Guide. >As someone only moderately interested in Plath and Hughes, but very interested in reading and writing, I found this immensely rewarding. I found it rewarding for the same reason. Wonderful book and wonderful review of it. I really appreciated the way she broadened it out to address so many larger questions. I’ve been wanting to read this ever since I read about it on Other Jenny’s blog. It sounds great! I am really looking forward to getting to it. What a great review, Teresa — you’re dealing with just the sorts of things that made it interesting to me in the first place. All those questions she raises are so interesting. Her writing on their relationship is good too, but it’s such a familiar story that I don’t think it could set the book apart on its own. I’ve not been interested in this book because I am not all that interested in Plath and Hughes, however all the issues you say Malcolm raises about truth and biography sound fascinating and I might have to read the book just for that. Thanks for such an interesting review! It really is almost as much about the craft of biography and the work of biographers as it is about Plath and Hughes. Their story is a good example of the challenges, which makes their story all the more interesting. I am interested in Plath and Hughes as well as the craft of biography. I thought your review was perceptive and the quote you selected from Malcolm was enough to persuade me to read the book. If you’re interested in Plath and Hughes *and* in biography, this is certainly a must read! I am not enjoying biography much these days, but this sounds like it addresses issues I’m interested in. Plus, I used to wonder what all the kerfluffle was about over Hughes and how he supposedly mistreated Plath, or whatever was the matter with the way he and his sister presented her poetry posthumously. I had been curious about some of these same things, and Malcolm spent enough time on the question of posthumous treatment of her work to satisfy my curiosity. What went on during her life is cloudier, I think. I liked that she addressed those questions about them but made the book about so much more than their lives. Thank you for this review, Teresa. TBR. May I have permission to reblog this? Facinating! Ordered! I miss Half.com.